The Paint Runner is essentially a blown-up, hollowed-out paint roller. 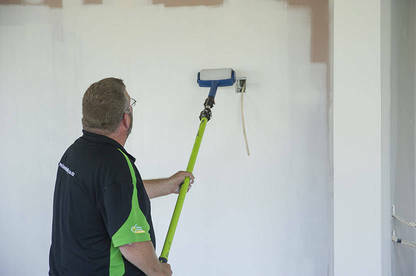 When you’re flicking through the TV channels, the odds are pretty good you’ll see an excitable bloke flogging The Renovator Paint Runner Pro. We took him up on his “buy one, get one free” offer to see if his Paint Runner really offers the even finish of a roller without drips and splatter. The Paint Runner ($120 including postage) is essentially a blown-up, hollowed-out paint roller. You pour up to a litre of paint in the cylinder, and it is then pushed out through small holes on to the roller’s microfibre pad when you run it down a surface. The idea is since you carry your paint with you, there’s no need for multiple trips back and forth to the tray to re-coat your roller. We enlisted Kieran Kelly, Wellington Master Painters vice president, to serve as a product tester and expert judge at a nearly finished new-build. After “priming” the runner as directed, we topped up the paint — in this case sealer for our first coat on the plasterboard wall — and got stuck in. First impressions weren’t great as the sealer struggled making it through the thick microfibre pad. Considerable force was needed to get a decent amount on to the wall. The Runner can be screwed on to any broom pole to extend your reach but we found this made applying sufficient force difficult. Results were better when we ditched the pole and held the Runner by its handle, making it easier to apply the pressure required for good coverage. However, we were impressed at the lack of drips and splatter. When full of paint, you’d be confident carrying the Paint Runner through the house over uncovered carpet to another job, something that couldn’t be said for a traditional roller. Next, we filled our other roller up with topcoat, but again found a decent amount of pressure was required for good coverage. Kieran reckoned the finish wasn’t close to what he’d get from a good standard roller, with a textured and, in places, “bubbly” appearance. The “flocked edger” for cutting-in around window frames, skirting and ceilings gave a slightly uneven, textured finish. Another issue is the Runner’s narrowness as standard rollers are usually twice as wide, which makes it easier to paint straight, even lines. While the Runner claims to cover up to 17m² of wall with one litre of paint, our trial found it was closer to 6m²/L. In contrast, the rule of thumb for roller painting is 12m²/L. Once the microfibre pad wears out, replacement sleeves set you back $35 each including postage from TV Shop, compared to less than $5 for a standard roller cover. We found the pad difficult to clean. Also included is a “flocked edger” for cutting-in around window frames, skirting and ceilings. It worked reasonably well, but again we had to push hard and it also gave a slightly uneven, textured finish. It only holds a small amount of paint so it needs regular refilling. At smoko, the verdict on the Paint Runner Pro was mixed. 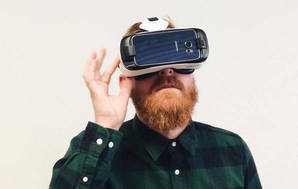 Kieran said “it’s certainly not a trade tool, and far from a timesaver for big jobs, but it’s not a complete lemon”. He gave it four out of 10 for performance but added “it could be a good option for a landlord who wanted to whip around a few of his properties touching up damage”. We agree. 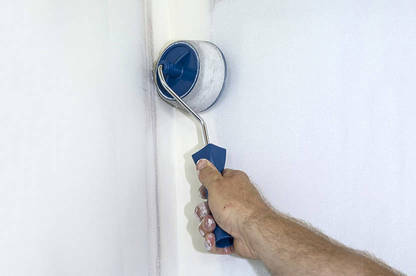 We think the Paint Runner Pro is worth considering for small jobs, but if you’re tackling bigger projects, such as repainting a room, you’d be better off with traditional wider rollers. Price: $120 including postage from TV Shop or $99 from Mitre 10. Included in the box: edger, corner pad, resting tray, “easy-pour” jug and instructions. Contains adapter for threaded pole, alternatively will fit a non-threaded broom handle without adapter.